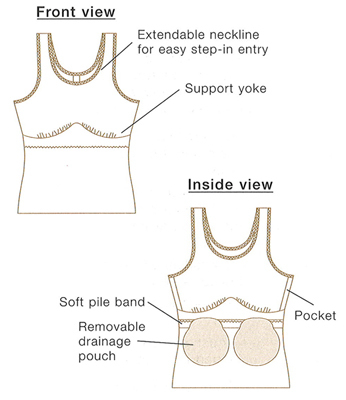 Perfect post-surgical camisole to be worn immediately following breast surgery, Also a comfortable garment to wear during your treatment phase. Made of a soft cotton/lycra fabric that gently hugs your body for a secure fit. Comes with one fiberfill leisure form to balance your shape. Additional forms available if needed. Two detachable drain pouches included to aid in drainage management. Garment should fit snug. Choose size based on blouse size. Get the lowest price on Amoena 2105 Amoena Post-Surgery Camisole Model 2105. We are dedicated to always offering the best service and value to our customers. We will match the price, at the time of purchase or until 7 days after your purchase, on a Price Match Guarantee product if you find the same item ( Amoena 2105) at a lower price at a Designated Major Online Retailer or at a local retail competitor's store in the US.